Don’t Forget About Your Flower Girl! Planning a wedding is no small task, and flowers are one of the most fun ways to express personal style on your special day. Brides usually have an idea of what they’d like for their own bouquet as well as their bridesmaids, but what about the flower girl? There are a wide variety of popular floral accessories for your little helper that will brighten her day knowing that you thought of her. One of the most traditional flower girl accessories is a small basket of flowers matching the floral theme of the bride. This can be adorned with ribbons or greens, and can either contain a small arrangement of flowers or pretty petals to be strewn along the wedding aisle. Matlack Florist knows that sometimes little flower girls can get very excited walking down the aisle, so we provide a foam based arrangement in our baskets. This way, if the basket gets flipped upside down or thrown, the flowers stay in tact. One of the wedding trends coming back in style is the pomander bouquet. This contains a foam based arrangement of flowers in a sphere shape, attached with ribbons to hold. 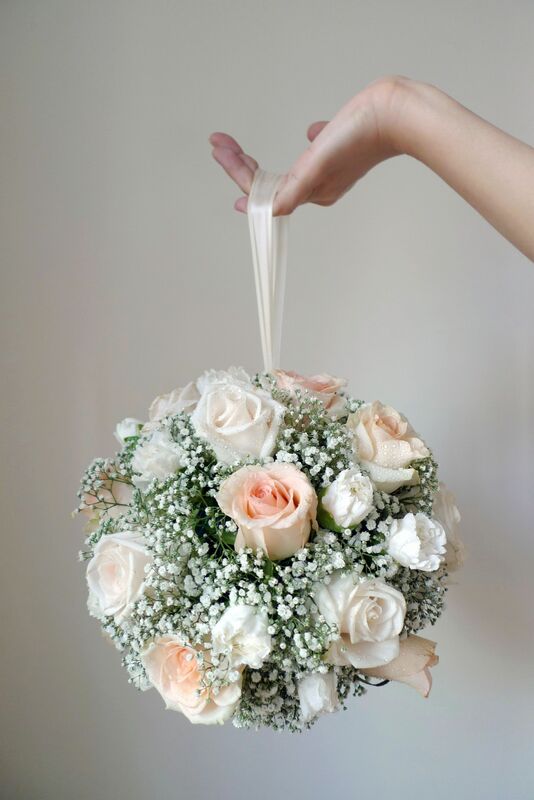 These are a cute way to include an older flower girl who might not want to hold a basket. Hydrangea, baby’s breath, or sweetheart roses are all fantastic options to make the most out of your pomander, and accent flowers from the bride’s bouquet can really make them pop. In addition to our previous post highlighting these fun accessories, flower crowns can be a great way to showcase your flower girl without having something to hold down the aisle. This option is neat way to care for a flower girl that is too young to hold a floral accessory in her hands, or one that is perhaps already holding the hand of a ring bearer or another bridesmaid. Another fun trend coming up from the past few seasons is the floral wand. This consists of a single flower or a small bouquet on top of a long pole to be held. The top of the wand can be accessorized with wiring, jewels, or ribbons, and the pole can coordinate with the wrapping of the bridal party’s bouquets to give a cohesive look. No matter what you choose, your flower girl will be ecstatic that you thought of her on your big day. Matlack Florist is proud to cater to a wide variety of different floral accessories for weddings, as well as every special event in your life. Keep stopping in and seeing what else we have to offer for each new season! Enjoyed this reading? Like us on Facebook and Instagram @matlackflorist for daily floral inspiration! Mixed bunches are one of the most popular ways to give flowers because of their diverse array of multicolored blooms, colorful wrapping and ribbons, and their affordable price. Matlack Florist always has a selection of assorted mixed bunches to easily pick up on a whim for that “just because” kind of gift. Receiving a mixed bunch is always fun because you can decide how best to display it. Here’s a few options you might not have considered before. Of course flowers look lovely in a vase, but have you ever tried displaying them in other containers found around your home? A pitcher provides a sustainable water source for your mixed bunch while adding some flair, just like in our “Totally Tulips” arrangement available in the springtime. Other interesting containers around your home could be a watering can, teapot, or a coffee can. Whatever you use, it’ll be sure to become a conversation starter for visiting guests. If you don’t own a large vase to place all the stems from your mixed bunch into, consider placing smaller vases all around your home. This way, no matter where you’re walking around, the lovely aroma and style of flowers will bring a smile to your face. Try dropping a few flowers from your bunch into a small vase in the bathroom, one of the most forgotten rooms in the house. Or, take multiple containers, fill them with blooms, and connect them together with wire, grasses, or branches for a stunning table runner. Right now, Matlack Florist is featuring July 4th mixed bunches of red, white, and blue. Pick one up today and decide for yourself how best to display our beautiful blooms! Last week, we asked our designers to each create a Fourth-of-July-themed floral design for our first ever Battle of the Blooms™. Then we asked you to vote for your favorite design for a chance to win one of the arrangements. Our designers created some truly beautiful patriotic floral pieces, you voted, and a winner was chosen! The most popular floral arrangement, pictured here, was created by designer, Martha! Her arrangement included blue hydrangea, white stock, and a cluster of red roses, accented with a touch of silver sparkle, red midollino sticks, and the finishing touch for the Fourth of July, Old Glory! Congratulations to our winner, Lauren, and a BIG THANK YOU to all who were involved! We were so excited by the amount of enthusiasm from everyone who participated in this event, from the designers here at the shop to everyone who voted for their favorites! We were even more excited when the winner announced to us that she would be donating her prize arrangement to the Westtown East Goshen Police Department! What a wonderful act of generosity and a great way to celebrate everything that our nation stands for! It’s that time of year again! Patriotic parades, backyard barbecues, flashy fireworks…it’s time to celebrate America! To kick off the holiday week, we asked our designers to each create an arrangement that embodies the ‘Spirit of America,’ and we are giving you the chance to WIN one of the arrangements for your own Fourth of July celebration! All you have to do to win one of these beautiful blooming arrangements is vote for your favorite on our Facebook page! To cast your vote, simply LIKE our Facebook page and then LIKE the picture of your favorite arrangement. For a bonus entry, tell us why you like the arrangement you voted for in the comments! Read on to see what our talented designers created, as well as their inspiration for each design. You can click on any picture below and you’ll be redirected to the picture on Facebook where you can place your vote! The winner will be chosen by random draw from all participants who voted for the most liked arrangement. The winner will be announced on Friday, July 1st on Facebook. Only one (1) entry per person is permitted. GOOD LUCK TO ALL… AND HAPPY INDEPENDENCE DAY! The beginning of June marks the extra special event of graduation in the lives of many young individuals. 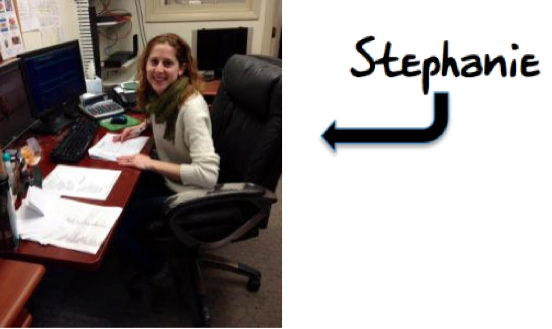 Whether it’s a Master’s degree or the end of a middle school era, at Matlack Florist, we love to celebrate milestones accordingly. Flowers are a great way to observe the commemorative event, and there are many different options to cheer on your graduate. Presentation flower s are popular for graduates, and they can be done in countless different varieties. One of our favorites ways to present graduation flowers is to arrange them in the graduate’s school colors with a matching bow, and the photos will look great with all of the coordinated colors. Presentation bouquets come in all price ranges and have a great deal of customization options for color options. Come in and ask what we have in your graduate’s school colors. If you’re looking for an all-in-one graduation present, consider our money corsage. They’re a fun way to incorporate a gift of money and wear during the commencement, not to mention being the envy of all their fellow graduates. The bills can be folded into shapes like origami and wired into the corsage so they can easily be taken out. Additionally, the corsage can also be done in the graduate’s school colors with matching flowers. This money corsage pictured on the left was made at Matlack Florist for a Lehigh University graduate in her school’s colors. Decorating the graduation cap has been a long standing tradition amo ng graduates, and at Matlack Florist we have a trendy solution if you’re having trouble finding the perfect cap decoration. Adorning the cap with a floral hair wreath is both modern and glamorous, and completely unique. They can be attached to the cap easily and taken off, and can be made out of fresh blooms or silk flowers. Congratulations to all of the 2016 graduates! At Matlack Florist we hope to continue celebrating with you all year long. Caring for Your Valentine’s Day Roses! Did you receive a lovely bouquet of roses from your one and only this Valentine’s Day? Lucky you!! Those blooming beauties may not live forever, but with proper care, your cut roses could last up to a week or more! Follow the tried-and-true tips below to ensure that your beautiful blooms stay fresh for as long as possible! (If your roses arrived already arranged, you can skip steps 1-4). First things first, make sure to choose a clean vase for your flowers! It cannot be stressed enough how important good, clean water is for the longevity of your roses. You’ll want to fill your vase two-thirds full with lukewarm water, and then add the floral preservatives that you should have received with your flowers. The floral preservatives will help to keep the water bacteria-free and provide essential nutrients for your roses to extend their life. Continue reading Caring for Your Valentine’s Day Roses! Good news for Poinsettia-lovers; your favorite holiday plants are not toxic! The Society of American Florists teamed up with researchers at Ohio State University to complete scientific studies on the toxicity of poinsettias on both people and pets. The results indicated that there were absolutely no reasons to worry about the effects of these plants on the health of your children or pets! 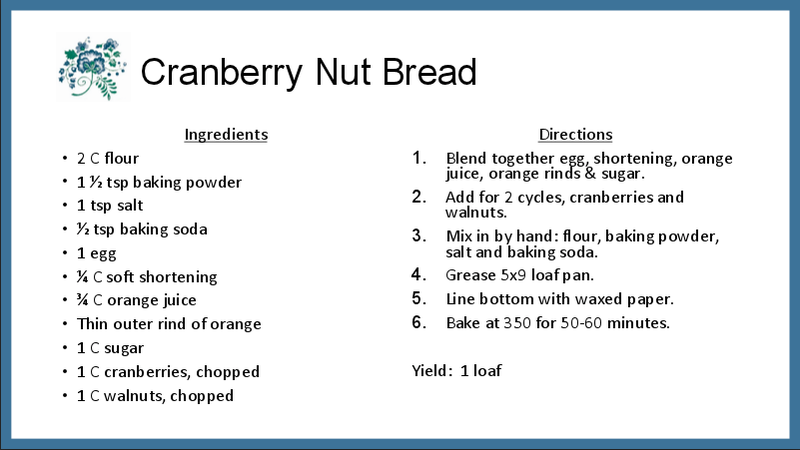 The POISINDEX Information Service, the primary resource for most poison control centers, states that a child would have to ingest 500-600 poinsettia leaves to exceed the experimental dosage that revealed no toxicity on test animals. However with that said, poinsettias, like most other ornamental plants, are not intended for consumption. Our Holiday Open House is quickly approaching! This Friday (12/5) and Saturday (12/6), join us as we fill the shop with the spirit of Christmas! 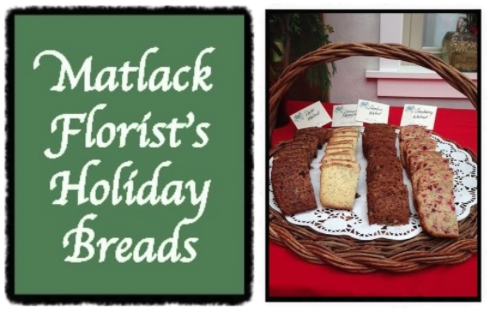 Enjoy the sights, sounds and scents of the season here at Matlack Florist, while you shop for great seasonal decor items for your home and gifts for loved ones!! For more details on this year’s event, please visit our previous Save the Date post! 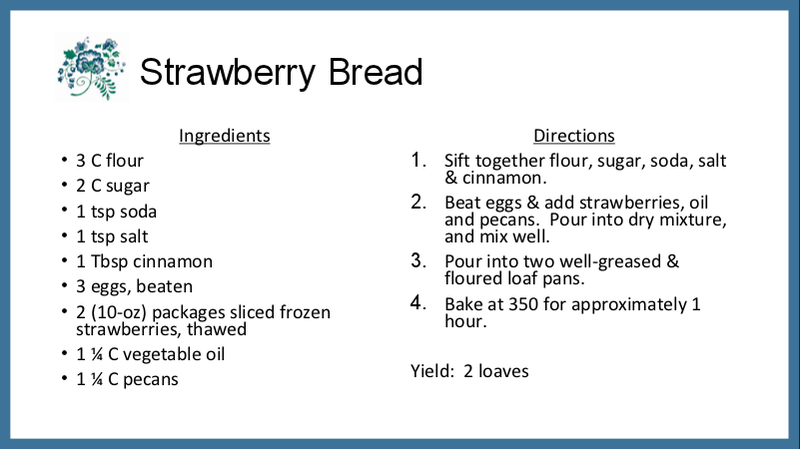 Every year, we serve our family-recipe homemade breads for customers to nosh on while they shop, and inevitably we receive many requests for the recipes! So this year, we thought we’d beat you to the punch, and post them online for you to enjoy! 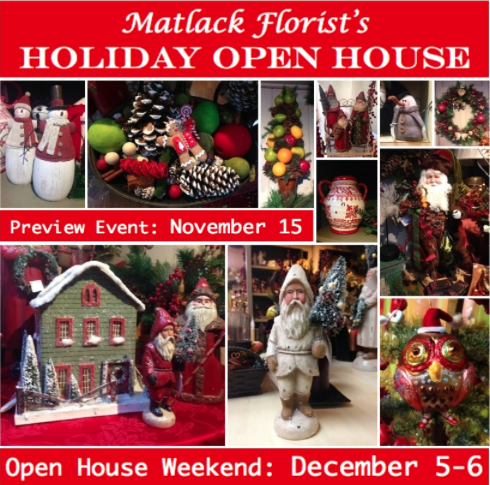 Please join us for Matlack Florist’s 36th Annual Holiday Open House event! Continue reading Save the Date!! This Fall Harvest Bridal Shower was held for our very own favorite administrative assistant here at Matlack Florist, Stephanie! After having worked with Stephanie for a year and a half at the shop, I was honored when she asked me to be a part of her bridal party, and so excited to plan a bridal shower with my fellow bridesmaids! 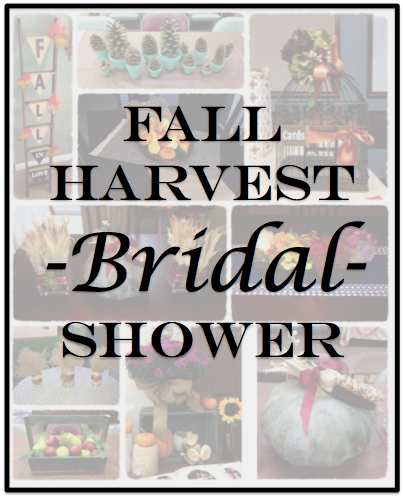 To celebrate this autumn-loving bride-to-be, we planned a shower to fit the season with a Fall Harvest theme. We used a lot of our own personal items from home and added festive touches of fall to each item for the shower! This miniature-sized ladder (right) was decorated using cardstock cut into pennant shapes (which were attached to the ladder using decorative washi tape), letter-shaped stickers to read “Fall in Love” and finished off with autumn leaves! The bridal shower umbrella (below) was decorated with faux fall leaves as well to incorporate it into the theme!